Cinnamon, one of the first trade spices of the ancient world, is highly delicious and powerfully medicinal! Cinnamon is one of the oldest tonic plants on the globe. It’s been used medicinally for thousands of years, dating back to before the great pyramids of Egypt were built. The plant can reach heights of up to 30 feet. The leaves are deep green and the blossoms usually white. Once the trees reach six or seven years old, the bark is peeled off into cinnamon sticks. Antibacterial and antifungal: Research has shown Cinnamon is one of the most effective substances against E-coli, and Salmonella, as well as,Campylobacter . Another study found Cinnamaldehyde from Cinnamon Bark Oil in its various forms is effective against adenovirus. Cinnamon Oil was effective against three strains of Candida, Candida albicans, Candida tropicalis, and Candida krusei. Great for digestion: As a digestive, cinnamon dramatically reduces the uncomfortable feelings associated with IBS especially bloating. 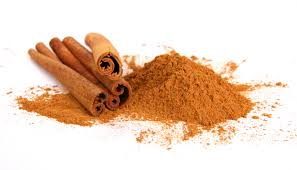 Stomach bugs or stomach flu: Cinnamon is a natural astringent and will dry up your bowel very quickly. Reduces LDL Cholesterol: Studies have shown that just a half of teaspoon of cinnamon per day can help lower LDL cholesterol. Enhances cognitive processing – just from smelling cinnamon! Adding cinnamon to your diet is simple, healthful, and tasty. You’ll want to purchase ceylon cinnamon or “true” cinnamon, which does not contain high contents of coumarin (a substance that can be toxic to the liver at high doses). A typical dose of cinnamon may be up to 2 tsps a day. A safe dose may be 1 tsp per day – but be sure to check with your doctor before taking regularly. While cinnamon is a very safe spice for children, be sure to test them for allergies or sensitivities before adding it to their diet. A sprinkle a day would be appropriate for the youngsters.